93QUEEN is set in the Hasidic enclave of Borough Park, Brooklyn, where EMS corps have long been the province of men. Though the neighborhood is home to the largest volunteer ambulance corps in the world known as Hatzolah, that organization has steadfastly banned women from its ranks. Now Ruchie and an engaging cast of dogged Hasidic women are risking their reputations—and, literally, the futures of their children—by taking matters into their own hands to provide dignified emergency medical care to the Hasidic women and girls of Borough Park. With unprecedented and exclusive access, 93QUEEN follows the formation and launch of Ezras Nashim through the organization’s first year on the ground. The spine of the film observes the highs—and the lows—of creating an organization against incredible odds, as well as the women’s struggles to “have it all” as wives and mothers. In a society where most women don’t drive—and a few minutes can mean the difference between life and death—how do female EMTs transport themselves to the scene of an emergency? And how does Ezras Nashim combat a behemoth like Hatzolah, which possesses political clout not only in Borough Park, but throughout New York City? In the midst of this already ground-breaking endeavor, Ruchie announces that she had decided to take her burgeoning feminism even further: She entered the race for civil court judge in Brooklyn’s 5th Municipal Court District. Five years ago, I uncovered a shocking act of defiance in an unexpected setting that I now see as a Hasidic variation of the Me Too movement. While an all-female EMT corps is remarkable in itself, I was even more intrigued by the context surrounding Ruchie’s efforts and its implications in Hasidic Brooklyn. As an Orthodox Jewish woman myself, I immediately understood that the formation of Ezras Nashim would be a significant cultural disruption to the gender-segregated Hasidic community. For decades, Hatzolah has actively prevented women from participating in their Emergency care corps and now made it known they were not going to make space for the women’s solution that is Ezras Nashim. But, these women were refusing to take to no for an answer. Until that moment, I had never heard of proud Hasidic women challenging their community's status quo; Their courage and persistence in demanding systemic progress—especially in the face of fierce opposition from the all-powerful patriarchy—is why I made 93Queen. In Hasidic culture, secular media is taboo and women typically shy away from any sort of public attention. In fact, Hasidic publications do not print photos of women at all. In addition to being overlooked by Orthodox press outlets, women like Ruchie and her fellow EMTs are seldom, if ever, given a voice in mainstream secular media. These women are universally shut out. As a filmmaker and insider, who understands Hasidic modesty tenants and agreed to follow them in the making of the film, I was granted unprecedented and exclusive access to bring these women to the forefront through the David and Goliath story of Ezras Nashim. Over four years of filming, I operated as a one woman-crew to subtly capture the highs and the lows of creating Ezras Nashim, from its inception through its launch, and, finally, Ruchie’s surprise run for Brooklyn Civil Court judge. The result is a rare documentary portrayal of observant Hasidic women ... from their point of view. My commitment to allowing minorities to tell their own stories extends to our music as well. The vocals interlaced into Laura Karpman’s masterful score are sung by Hasidic singer Perl Wolfe. Perl is the former lead singer of the first all-female Hasidic band, Bulletproof Stockings. Women are forbidden to sing publicly in mixed company in Hasidic communities, so Perl’s riveting and raw vocals literally give Hasidic women a worldwide voice. The vocals are a combination of traditional Hasidic melodies known as niggunim that are almost always sung by men, as well as an original song built with lyrics from a Jewish prayer that highlights the power of women. Perl’s vocals inherently reclaim another male-dominated space and serve as a “Greek chorus” for our story. No one embodies the confounding dichotomy between tradition and modernity quite like Ruchie Freier. While toeing the blurred line between redefining traditional roles and merely updating them, Ruchie takes matters into her own hands to move her community forward — first with Ezras Nashim and then with her political campaign. Ruchie’s personal evolution from community activist to community leader presents a thought-provoking—yet challenging—model of progress. Whether they recognize it or not, Ruchie and the women of Ezras Nashim have laid the groundwork for a lasting and sustainable change in the Hasidic community. And like women all over the globe, they have proven to be the most potent force their community has to combat injustice and fulfill societal needs. Paula Eiselt is an independent filmmaker and graduate of NYU’s Tisch School of the Arts with a double major in Film Production and Cinema Studies. Her work has been supported by the Independent Television Service (ITVS); the Sundance Institute Documentary Film Program with support from Open Society Foundations and Just Films | Ford Foundation; the New York State Council on the Arts (NYSCA); Fork Films; the Gucci Tribeca Documentary Fund, with support from the Oath Foundation; the International Documentary Association Pare Lorentz Documentary Fund; Picture Motion; the Hartley Film Foundation; the Independent Filmmaker Project (IFP); and Women Make Movies (WMM). 93QUEEN is Eiselt’s feature directorial debut. 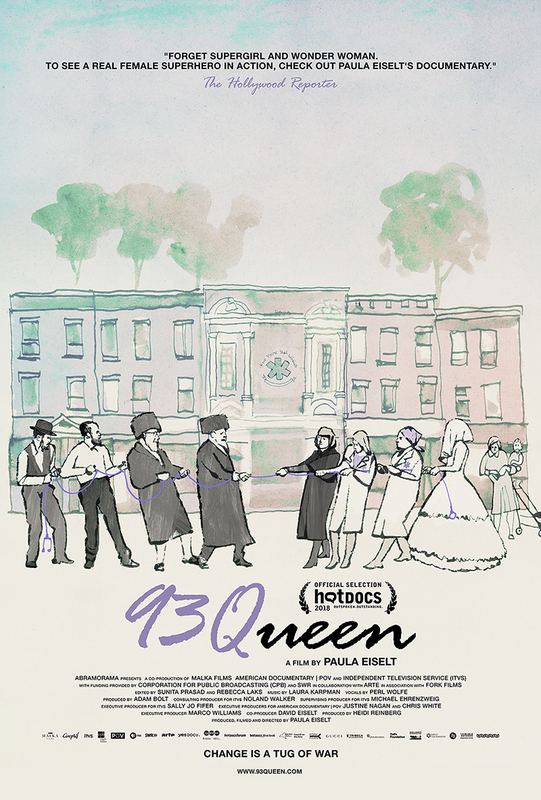 93QUEEN won the top inaugural first look Pitch Fund prize at the 2017 Hot Docs Forum and had its World Premiere at Hot Docs in 2018 followed by a theatrical release and POV broadcast with support by the NYC Mayor's office Made in NY program. In 2017, Eiselt had the great privilege of being selected as a Creative Producing Fellow for the 2017 Sundance Creative Producing Summit and was also a 2016 IFP Documentary Lab fellow. Most recently, Eiselt was invited to join the prestigious POV/Wyncote Filmmaker Fellows cohort at the PBS Annual Meeting in May 2018. In addition to her feature docs, Eiselt is developing a New York Times Op-Doc on Jewish identity in collaboration with the team behind the “In Conversation on Race” series. Previously, Eiselt served as Director of Programming at The Edit Center where she launched and designed their Documentary Filmmaking program. Additional credits include researcher for The Undocumented (Independent Lens); and AP for Bronx Princess (POV). Additional directing credits include short films Priscilla (NY New Filmmaker Series at Anthology Film Archive); My Mom the Dead Head (Cannes Film Festival's Short Film Corner) and The Fitting Room (NY Jewish Student Short Film Festival). Eiselt currently lives in NJ with her husband, two curious sons and a sassy daughter… although she will always remain a New Yorker. Since then, Reinberg has produced for such acclaimed documentary directors as Academy Award– winning Ross Kauffman, and the celebrated filmmakers Jeremiah Zagar and Mai Iskander. Her projects have focused on a range of subjects, including conflict photojournalists, Alzheimer’s disease, and Cairo’s indigenous trash collectors, and her films have appeared at such prestigious festivals as Sundance, Berlin, and Hot Docs, and on broadcasters such as HBO, PBS, LOGO, and Al Jazeera America. Reinberg has worked on several series for HGTV, directing the network’s popular House Hunters International, Beachfront Bargain Hunt, and Lakefront Bargain Hunt shows. She also served as a consulting producer for Cinelan, one of the foremost producers of award-winning branded content, with whom she developed multiple series for Fortune 100 clients, including GE and Microsoft. In addition to 93QUEEN, Reinberg is currently producing Maisie Crow’s UNTITLED HIGH SCHOOL BORDER PROJECT, which was awarded an IDA Enterprise Fund Development Grant. That film was also selected for this year’s Good Pitch–Local in Dallas. Marco Williams is a filmmaker and a film educator. His directing credits include: Lonnie Holley: The Truth of the Dirt, The Black Fives, The Undocumented, Inside the New Black Panthers; Banished; Freedom Summer; I Sit Where I Want: The Legacy of Brown v. Board of Education; MLK Boulevard: The Concrete Dream; Two Towns of Jasper; Making Peace: Rebuilding our Communities; Declarations: The Spiritual Deficit and The American Dream; Without a Pass; In Search of Our Fathers; and From Harlem to Harvard. He is the Co-Director and Co-Producer of Tell Them We Are Rising: The Story of Historically Black Colleges and Universities. Williams’ films have been broadcast on PBS (POV and Independent Lens), The History Channel, Nat Geo, Discovery Times, The Learning Channel, SBS Australia, and the BBC. His films have been exhibited at The Whitney Museum Bieneal, The Sundance Film Festival, Berlin Film Festival, Toronto International Film Festival, Hot Docs Film Festival, Full Frame, True/False, and numerous other film festivals throughout the world. the Full Frame Documentary Festival Spectrum Award, and the National Association of Black Journalists First Place Salute to Excellence Award. Most recently, Adam Bolt produced, edited, and wrote Ladies First: Saudi Arabia’s Female Candidates, which premiered at the Margaret Mead Film Festival. Bolt edited/co-wrote the Oscar-winning documentary Inside Job, and he recently won an Emmy for his work on the Showtime series Years of Living Dangerously, where he served as Editor, Writer, and Senior Producer. Other credits: Park Avenue: Money, Power & The American Dream, which premiered on PBS's Independent Lens and went on to win a Peabody Award in 2013; Page One: Inside the New York Times, nominated for two Emmys in 2012; and HBO’s The Recruiter, which won a Columbia duPont award for excellence in broadcast journalism in 2018. (Vice). As a visual artist, Prasad has won awards and accolades from the Art Matters Foundation, Art in America, and the Brooklyn Arts Council, as well as international residencies and exhibitions in New York, Paris, Barcelona, Montreal, and Bangalore. Rebecca Laks is a film editor based in New York City. Laks’ most recently edited the ITVS documentary Home Truth, which will air on PBS in Fall 2018. Laks’ previous narrative and documentary work includes Years of Living Dangerously (National Geographic), Hot Girls Wanted (Sundance Film Festival; Netflix), Missing People (LA Film Festival 2015) and The Punk Singer (IFC Films). Laks also edits commercial and music videos and teaches editing at The Edit Center in New York City. COTTON CLUB and scored THE REAGAN SHOW for CNN Films. She had two films at Sundance this year, and is looking forward to the release of her new score for the romantic comedy SET IT UP, due for a spring theatrical release. She was commissioned to create several pieces for season 4 of MOZART IN THE JUNGLE, and is feature on the Sony Classics soundtrack. With a doctorate from Juilliard, Karpman remains active in concert music. Commissioned by Carnegie Hall, she collaborated with soprano Jessye Norman and The Roots on the Grammy Winning ASK YOUR MAMA, a multimedia opera on a text by Langston Hughes. Laura has been commissioned by the Glimmerglass Festival and is developing the opera BALLS - a collaboration with NY Times columnist Gail Collins. She is currently working on a piece for soprano Deborah Voight, and she recently curated a concert of Academy music for the Los Angeles Philharmonic. Laura has received two GANG awards and an additional nomination for her videogame music which has been performed by orchestras internationally. She’s also an Annie Award nominee for Best Music in an Animated Feature. She serves as an advisor for the Sundance Film Scoring Labs and is on the faculty of the USC Film Scoring Program and is the founding President of the Alliance for Women Film Composer. She is most proud to be the first female governor of the music branch at the Academy of Motion Picture Arts and Sciences where she is currently serving her first term. Perl Wolfe is a musician, songwriter, and music producer. She is best known as the lead singer and co-founder of Bulletproof Stockings, an all-girl Hasidic rock band from Crown Heights, Brooklyn. Born and raised in a Hasidic family in Chicago, IL, Perl showed an interest and aptitude for music early on. She began training in classical piano at the age of 5, and soon began performing in recitals and competitions. She sang in choirs throughout her childhood, but it wasn’t until a move to NYC, that she began writing and performing original music. After writing a number of songs in the spring of 2011, Wolfe set out to create an all female band, hoping to build an empowering environment for women of all walks of life to come together through music. A few months later, Wolfe was introduced to drummer Dalia Shusterman, and Bulletproof Stockings was formed. Perl’s thoughtful, evocative lyrics, transportive melodies, and powerhouse vocal performances, quickly helped gain the first all-woman Hasidic rock band a following as well as media attention and acclaim. The first of its kind, Bulletproof Stockings was revolutionary, offering women a safe space that was entirely their own, in a rock music scene dominated by men. Bulletproof Stockings grew a loyal fan base, produced an EP, “Down To The Top,” a full-length album, “Homeland Call Stomp,” and toured the country, performing in many legendary rock venues. In April 2016, after a whirlwind national tour, the group disbanded. 93QUEEN is a co-production of MALKA FILMS, SWR in collaboration with ARTE, AMERICAN DOCUMENTARY | POV, and INDEPENDENT TELEVISION SERVICE (ITVS) with funding provided by CORPORATION FOR PUBLIC BROADCASTING (CPB) and has been produced with the support of The Sundance Institute Documentary Film Program with support from Open Society Foundations and Just Films | Ford Foundation, the New York State Council on the Arts, Fork Films, the Gucci Tribeca Documentary Fund, with support from the Oath Foundation, the International Documentary Association Pare Lorentz Documentary Fund, the Hartley Film Foundation, Independent Filmmaker Project and Women Make Movies. Outreach support provided by Picture Motion.